Ugh. Not very welcoming, is it? We have boots and hats and gloves that need to be left out to dry and no place in which to put them. How I wish we had a mudroom in this house. But as it is, we have one small cabinet to hold hats and scarves and one front closet overflowing with snow pants and coats. I admit our solution to winter gear chaos is ugly. Gloves that are wet but not enough to be run through the dryer are left on the air vent to dry and boots get tossed on a rug. There's barely enough room to walk into the house. I desperately needed a prettier solution. Ahh! So much fresher and tidier! 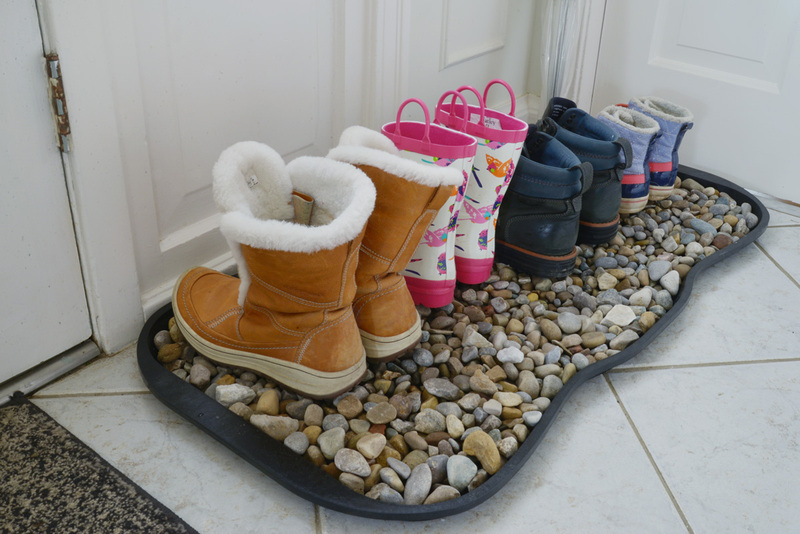 This project was as simple as filling a boot tray with beach rocks bought from the garden centre. Hanging above, I created a little sign that says "The Dirt Stops Here" and put it in a fancy picture frame. 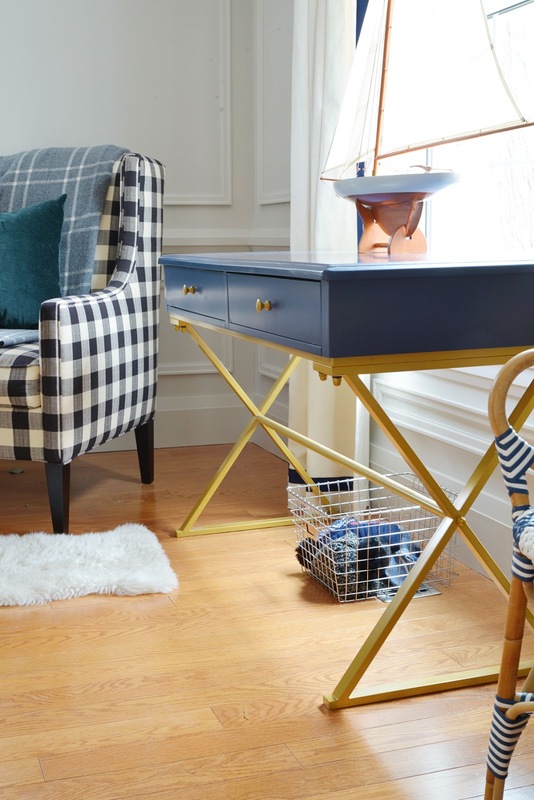 The brass adds a touch of glam to this functional zone. The boot tray, kindly provided by Ontario Tire Stewardship, is actually made of recycled rubber tires. Tires can be recycled into many different sustainable home products, from pavers to planters and even roofing shakes (who knew!). And you help divert tires from landfill every time you bring one of these eco-friendly products into your own home. The wet gloves and hats have been moved to this wire basket in the living room. It's still sitting on an air vent but at least the gloves are contained, tucked under a table, and I don't see them as soon as I walk in the front door. The exterior got a makeover too. Our porch gets super slippery with light snowfalls so an outdoor mat is a necessity. 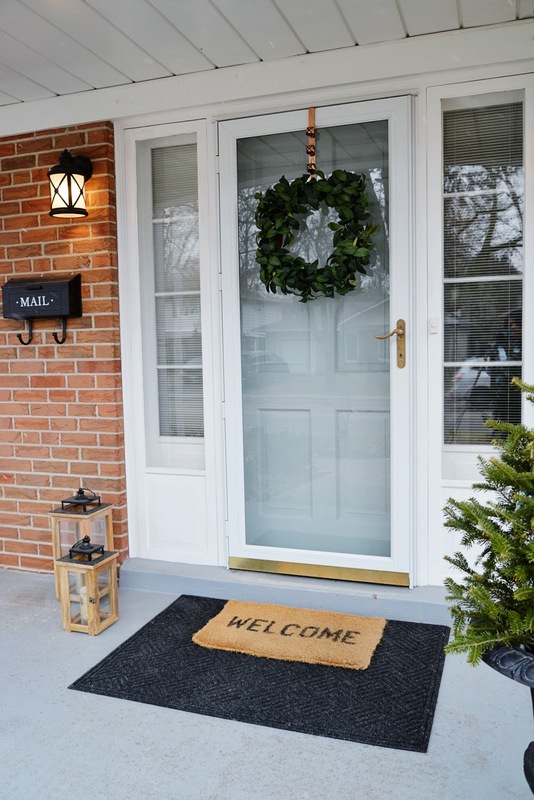 This recycled rubber floor mat has a non-slip backing and was a perfect addition to our front porch. You can check out Rethinktires.ca to find a variety of mats or other recycled tire products that might work in your own home. I'm still a big fan of the layered rug look so I've topped the mat with our coir mat. It brings in the warm tones of the lanterns and brass door accents. I've also changed out our holiday decor for simple greenery and black accessories to create a crisp and stylish look that will last throughout the rest of the winter. ...this is so much better! The little things really can make a difference. Disclosure: This post was sponsored by Ontario Tire Stewardship. All opinions and words are my own. Thank you for supporting the brands that make this blog possible.